I felt directly hailed – bird-dogged, even pigeon-holed – by Rosamond Wolff Purcell’s photograph Passenger Pigeon when I first saw it this past fall. The occasion was a visit to the Mount Holyoke College Art Museum with students in my first-year seminar, “The Nonhuman.” Preparing a list of works for the visit, Ellen Alvord, Weatherbie Curator of Education and Academic Programs, asked if I might be interested in Purcell’s Passenger Pigeon. I most definitely was, as a longtime admirer of Purcell’s work, including two exhibitions I was lucky enough to see at MHCAM: Bookworm (2007) and Two Rooms (2004). Passenger Pigeon is one of many photographs Purcell took of natural history specimens in the Western Foundation of Vertebrate Zoology in California, a project documented in the book Egg & Nest (2008). 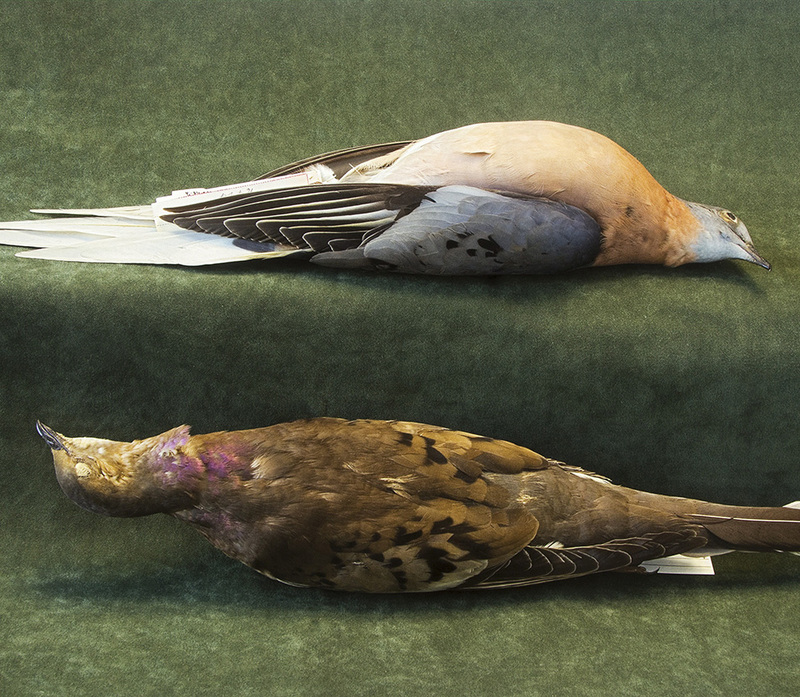 This photograph shows two passenger pigeon “study skins,” a form of taxidermy in which the bodies of birds are removed and replaced with cotton and the specimens laid flat for further study. Installation view, Bookworm: Photographs by Rosamond Purcell, Mount Holyoke College Art Museum, September 4 - December 16, 2007. The reason I felt so personally addressed by Purcell’s photograph is that for the last several years, I have been immersed in the world of taxidermy, for a book I am writing on the representation of animals, in novels and in other forms, in the late nineteenth century. Taxidermy flourished then. Preserved with new methods, positioned in more lifelike poses, taxidermied animals were featured in new natural history museums as emblems of species; meanwhile, commercial taxidermists served many customers, including sportsmen seeking hunting trophies, families decorating parlors with birds under glass, and, increasingly, pet-owners preserving their deceased dogs. Fascinated by this cultural history, I began looking at taxidermied animals in venues far and near. Very near, on the Mount Holyoke campus, these include a freakishly small deer under glass, in the curiosity-cabinets of the Joseph Allen Skinner Museum, and hundreds of animals arrayed for study in the hallways of Clapp Laboratory. Looking at taxidermy, I am often horrified but almost always enchanted: I find its oscillation between deadness and liveness – the animal body dead and artificially mounted, yet reconstructed to look whole and even on the verge of movement – uncanny. I am not alone in my fascination: in the twenty-first century, taxidermy is undergoing a new wave of popularity, with home taxidermists attending classes and conferences, television reality shows featuring taxidermy competitions, and hipster restaurants using taxidermy as retro chic decor. Scholars are analyzing the cultural and political history of taxidermy, and visual artists are using taxidermy in their work, including some who photograph pre-existing natural history specimens and, in so doing, reinterpret them. Baby deer in a parlor dome, from the collection of the Joseph Allen Skinner Museum, SK Q.A.1.8. Photograph by James Gehrt, 2012. I see Passenger Pigeon as part of this same contemporary conversation. The photograph offers an extraordinary meditation on the deadness – and behind it, the human violence – of taxidermied animals. Plumped with cotton and splayed for study, Purcell’s birds come into view as corpses. Their twoness confirms their deadness: the top bird almost seems to be resting, but the bottom one definitely is not. It is unnaturally torqued in what looks like postmortem rigidity, eye closed and blank, beak straining upward, head lifted off the ground. That ground, in turn, is mysterious – it seems to be made of green fabric, draped over steps or shelves – but it is clear what it is not: an attempted natural habitat, like a natural history diorama, in which upright birds are perched on branches as if alive. Nor are the corpses in the photograph redeemed into scientific utility. Two horizontal specimen labels are visible, one camouflaged amidst the white feathers of the top bird and the other nestled under the brown tail feathers on the bottom. But the words on these labels – the harvest of data from the corpses – are not legible. What is legible is the beauty of the photographic framing: the image is luminous, colorful, and larger than life. Taxidermied birds have long been inseparable from artistic projects: John James Audubon, for example, trained as a taxidermist, and he shot and mounted birds as a means to making his exquisite watercolors; the violence of bird taxidermy was the unacknowledged precondition to his art. Here, however, the beauty of the art seems a tool for acknowledging the violence. Again, the movement from top to bottom is key: the elegant colors and lines of the more “beautiful” top body give way to the mottled surface and twisted forms of the bottom one, on which the violent distortions of taxidermy cannot be denied; here, too, a bright splash of pink around the twisted neck seems like a strangulating stain of blood. And both birds – embalmed, horizontal, and monumental – seem to be lying in state. They await a commemorative burial that presents itself here not once but twice – both in the casket-like green space where the birds rest within the image and in the respectful funeral provided by the photograph itself. Canada Warbler at Clapp Laboratory. Photograph by James Gehrt, 2013. This is a burial for species as well as specimen: the passenger pigeon was infamously hunted to extinction through large-scale competitions; the last died in 1914. When I saw Passenger Pigeon in fall 2015, I was aware of this as a very un-happy birthday, just past the centennial of extinction. Passenger pigeons have been extensively memorialized: the last pigeon, named “Martha,” was sent in 1914 from Cincinnati to the Smithsonian for taxidermic preservation and display, and over the next century, the species has been remembered in public monuments, opera, song, poetry, and fiction, as well as contemporary art. Passenger Pigeon, entering this lineage of species memorialization, also seems to comment on it. The large size of the photograph seems an acknowledgment of the need to scale up in remembering an entire species. And the two very different birds – with their distinct colorations, their contrasting eyes, their reverse positioning – seem to stand in for the diversity as well as quantity of the hundreds of millions of Ectopistes migratorius forever gone. The invocation of Gettysburg values dead birds by comparing them to dead soldiers, although the comparison also makes me think of a crucial contrast between these mass-scale forms of death. The battles of the Civil War involved at least some volitional self-sacrifice on the part of their participants; passenger pigeons had no such volition, and it did not matter to them whether they were shot down for sport, study, food, or art. They were – to mix metaphors – sitting ducks for shooting humans. But if it is too late for passenger pigeons to fly away, then at least they can be remembered; the “great melancholy” they evoke can turn to active mourning. That they may be mourned here is thanks "to the light” and, of course, to Purcell herself. Here, in this image, two birds can briefly “levitate above the stage” – in the twinned magic acts of taxidermy and photography alike. Greenberg, Joel. A Feathered River Across the Sky: The Passenger Pigeon’s Flight to Extinction. Bloomsbury, 2016. Henning, Michelle. “Skins of the Real: Taxidermy and Photography.” In Snæbjörnsdóttir/Wilson, Nanoq: Flat Out and Bluesome: A Cultural History of Polar Bears. Black Dog, 2006. Poliquin, Rachel. The Breathless Zoo: Taxidermy and the Cultures of Longing. Pennsylvania State University Press, 2012. Purcell, Rosamund Wolff, Linnea S. Hall, and René Corado. Nest & Egg. Harvard University Press, 2008. Turner, Stephanie S. “Relocating ‘Stuffed’ Animals: Photographic Remediation of Natural History Taxidermy.” Humanimalia 4:2 (spring 2013): 1-32. A special thank you to Mount Holyoke Digital Projects Lead James Gehrt for providing his photographs of taxidermied specimens at Clapp Laboratory and the Joseph Allen Skinner Museum. More information about his photography is available at http://jamesgehrtphoto.com/.